Below you can view all the homes for sale in the Huntridge subdivision located in Las Vegas Nevada. Listings in Huntridge are updated daily from data we receive from the Las Vegas multiple listing service. To learn more about any of these homes or to receive custom notifications when a new property is listed for sale in Huntridge, give us a call at 702-323-5939. This home features a beautifully finished remodel, including a brand new modern kitchen with stainless steel appliances, stylish flooring, custom bathrooms with tiled showers & much, much more! This home will not disappoint! MLS#2088615. Forever Home Realty. New carpeting has been installed throughout. MLS#2087010. United Realty Group. Check it out for yourself, it is absolutely worth a showing! MLS#2084263. Forever Home Realty. Features SPACIOUS backyard with covered patio and dog run. Make an offer today! MLS#2079150. Motion Properties. New shower tile and huge backyard with covered patio. Welcome home! 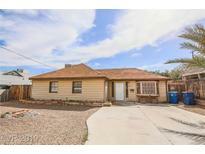 MLS#2077900. United Realty Group. The interior features tile and carpet flooring, spacious living area, and a large backyard. A must see! MLS#2076507. BHHS Nevada Properties. Front Yard Has Rock/Gravel Landscaping, Huge Backyard. Come Take A Look! ! 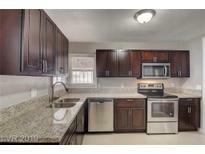 MLS#2076190. Blue Diamond Realty LLC. Home Features New Interior Paint, New Exterior Paint, New Blinds, New Front Landscaping, Tile Floors Throughout, Den That Can Easily Be Turned Into Another Bedroom, R/V Boat Parking, A/C Unit Around Seven Years Old, Nine Canary Palm Trees, Upgraded Bathroom W/ Jacuzzi Tub. Casita Has A Toilet. MLS#2075435. Elite Realty. 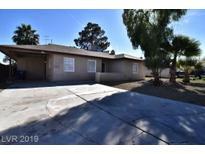 YOUR NEW HOME IN THE HISTORIC HUNTRIDGE NEIGHBORHOOD!Fully renovated: new flooring, updated bathrooms and kitchen w/custom cabinets & quartz countertops, great den with wood-burning fireplace & MORE!New roof 2015 with Solar panels and HVAC units 2016.Private backyard w/courtyard & BBQ area.Detached garage w/utilities for workshop or a casita conversion.TURN-KEY INVESTMENT OPPORTUNITY!This is a Licensed Short-Term Rental ready for a new operator. MLS#2070098. BHHS Nevada Properties. Hurry... this is a must see home. MLS#2071147. Rustic Properties. 2 bedroom, 1 bathroom, Home needs extensive Work. MLS#2070529. Realty Executives of SNV. Custom barn-style door on storage rm. Check the photos MLS#2037087. Realty ONE Group, Inc.
Property is subject to court probate. MLS#2024959. 81 West Realty. House Sitter In Property*circular Driveway Sets The Stage To Old World Style*fresh Paint*brand New Warm Color Carpet Thru-out*inviting Living Room*kitchen W/ Breakfast Bar & Beautiful Unique Floor Tile*master Bdrm W/ Bath*uniquely Designed Paved Concrete Backaryd With Your Own Wishing Well*storage Sheds For All Your Extras*enjoy All The Activities That Huntridge Park Offers*close To Excitement Of Las Vegas*shopping, Dining, Entertainment* MLS#1971119. Turn Key Property Solutions.